The Threat of Exile — and Abandonment, Chapter 23 in Loneliness and Longing. Brent Willock, Lori C. Bohm, and Rebecca Curtis Eds. pp 283-294. New York: Routledge, 2012. The New Unconscious: Opening Wider Perspectives on Society. Chapter 9 in Psychoanalytic Reflections on a Changing World. Halina Brunning, Ed. pp179-194. London: Karnac, 2012. Psychoanalysis at Work, Psychoanalytic Dialogues, vol 22: no 5 (2012), pp 517-528. The Radical Innovation of Sub Groups. Chapter 2 in Systems Centered Theory and Practice: The Contribution of Yvonne M. Agazarian. Fran Carter, Kathy Lum, Jim Peightel, Michael Robbins, Jan Vadell and Sven-Erik Viskari, Eds, pp. 57-66. London: Karnac, 2011. What You Don’t Know You Know: Our Hidden Motivations in Life, Business, and Everything Else. New York: Other Press, 2010. The School as an Organization, Schools: Studies in Education, 6 (2009): 138-142. Succeeding at Succession: The Myth of Orestes, Journal of Analytic Psychology, 53 (2008): 619-632. The Erosion of Our Profession, Psychoanalytic Psychology, 24 (2007): 1-9. Psychanalyse et psychotherapie: une relation longue et agitee, Revue Francaise de Psychanalyse, LXX (2006): 961-985. Psychotherapy and Psychoanalysis: A long and troubled history, The International Journal of Psychoanalysis, 86 (2005): 1175-95. Using Bion. Psychoanalytic Psychology, 22 (2005): 357-369. Leadership and the creation of authority. In Group Dynamics, Organizational Irrationality, and Social Complexity: Group Relations Reader 3. S. Cytrynbaum & D.A. Noumair, eds. (Pp. 289-302) Jupiter, FL, A.K. Rice Institute: 2004. Group relations and organizational consultation: Rediscovering our roots. In Group Dynamics, Organizational Irrationality, and Social Complexity: Group Relations Reader 3. S. Cytrynbaum & D.A. Noumair, eds. (Pp. 403-412) Jupiter, FL, A.K. Rice Institute: 2004. Korrupte Gruppen in heutigen Unternehmen, Freie Assoziation, 7 (2004): 9-20. Psychoanalytic training: The “faculty system,” (www.btinternet.com/~psycho_social/Vol4/V4.html) Psychoanalytic Inquiry, 24 (2004): 51-70. Case commentary: What is Ed about to do? Harvard Business Review, 82 (January, 2004): 22. Toward a psychoanalytic politics, Journal of the American Psychoanalytic Association, Supplement (2003): 301-321. Psychoanalysis as a profession: Past failures and future possibilities, Contemporary Psychoanalysis, 39 (2003): 557-582. 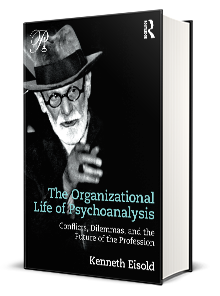 Psychoanalytic perspectives on organizational consulting: Transference and counter-transference. Human Relations, 56 (2003): 475-490. Jung, Jungians, and psychoanalysis. Psychoanalytic Psychology, 19 (2002), pp. 501-524. Institutional conflicts in Jungian analysis. Journal of Analytical Psychology, 46 (2001), pp. 335-353. What can institutes do? Commentary on paper by Randall Lehmann Sorenson. Psychoanalytic Dialogues, 10 (2000), pp. 909- 915. The rediscovery of the unknown: an inquiry into psychoanalytic praxis. Contemporary Psychoanalysis, 36 (2000), pp. 57-75. Teorie e poteri in psicoanalisi. Psiche, 1-2 (1999), pp. 239-252.
Review of Otto Kernberg’s “Ideology, Conflict, and Leadership in Groups and Organizations.” Psychoanalytic Books, 10 (1999), pp. 39-44. Vision in organizational life, in Social Dreaming @ Work, W.G.Lawrence, ed. London, Karnac Books: 1998. The splitting of the New York Psychoanalytic Society and the construction of psychoanalytic authority, The International Journal of Psycho-Analysis (October 1998) 79, 5, pp. 871-885. The task of leadership: leadership as an attribute of group life, ADE Bulletin, (Spring 1997), No. 116, pp. 33-37. Freud as leader: the early years of the Viennese Society, The International Journal of Psycho-Analysis, (February 1997) 78, 1, pp. Psychoanalysis today: implications for organizational consultation, Free Associations 38, 6(2), pp. 174-91. Creating authority: a task for group relations,. Proceeding of the Eleventh Scientific Meeting of the A.K. Rice Institute, West, Hayden, & Sharrin, eds. Jupiter, FL, A.K. Rice Institute: 1995. Vision in organizations, Proceeding of the Eleventh Scientific Meeting of the A.K. Rice Institute, West, Hayden, & Sharrin, eds. Jupiter, FL, A.K. Rice Institute: 1995. Clinical uses of dreams, The Interpersonal Handbook of Psychoanalysis, Lionells, Fiscalini, Mann, & Stern, eds. (Chapter 32) pp. 709-728, The Analytic Press, Hillsdale, NJ, 1995. The group dynamics of war, in Group Process and Political Dynamics, Ettin, Fidler & Cohen, eds., IUP: Madison, CT, 1995. The intolerance of diversity in psychoanalytic institutes, The International Journal of Psychoanalysis, (August, 1994) 75, 4, pp.785-800. On authority, Proceedings of the Tenth Scientific Meeting of the A.K. Rice Institute, Cytrynbaum & Lee, eds., Jupiter, FL: A.K. Rice Institute, 1993. Changing group relations: some problems and symptoms, Proceedings of the Ninth Scientific Meeting of the A.K. Rice Institute, Hugg, Carson & Lipgar, eds., Jupiter, FL: A.K.Rice Institute, 1993. On war: a group relations perspective, Psychologist Psychoanalyst (1991), XI (Supplement), 32-35.